Taken at the November 19, 2014 CONAIE march by Agencia de Noticias ANDES. In Latin America, indigenous groups are increasingly letting their voices be heard, whether through the cultural avenues taken by Chile’s Mapuche or the political advances of Mexico’s Zapatistas. Yet the changing relationships between these groups and their government should make any international observer pause. In some countries, the government’s efforts to co-opt indigenous movements and the members’ subsequent response call into question our straightforward notions of democracy and social justice. In Bolivia and Ecuador, indigenous groups have been more successful at institutionalizing, and as such at shaping, who holds power. Bolivian President Evo Morales is proudly indigenous, while Ecuadorean President Rafael Correa came to power with the support of the Confederation of Indigenous Nationalities of Ecuador (CONAIE). Both have introduced broad social reform agendas to help previously underrepresented groups, often composed of poor and indigenous citizens. However, these groups have demands that often exceed the capacity and political will of elected officials. In Ecuador, while Correa initially worked with CONAIE, the oil revenues he is now pursuing to finance his ambitious social programs lead him to conflict with the interests of the indigenous movement. Herein lies the question: what will happen to a strong indigenous movement that fluctuates between institutional democratic participation and civil society protest? How can it respond when traditional democratic avenues leave it open to co-optation and censure? Historically in Ecuador, CONAIE has had an interesting position of power compared to indigenous organizations in other Latin American countries. Ecuadorean indigenous groups have typically possessed power disproportionate to their numbers, and Larson sees Ecuador as one of only two South American countries to “have sustained large, institutionalized indigenous movements.”[i] As such, the strength of Ecuador’s indigenous movement was once hailed as a Latin American success story. The party subsequently developed because it used to be able to capture other sectors of society. While the strength of the current leftist movements detracts from indigenous party support, Pachakutik remains an important voice for indigenous peoples to promote their agendas. Recently, the party has performed poorly at the national level, though municipal elections still increase indigenous representation. So while Pachakutik did quite well nationally at one time, its current political weakness makes it a far less significant group than CONAIE itself. Whether this is due to a divided left or to a preference for non-institutional political change is up for debate. After all, autonomy and self-government is an important goal for many indigenous movements. Contrary to their goals, institutionalization is often viewed as exposing their movements to state assimilation. [vi] This course would promote institutional conformity and fail to achieve significant change. CONAIE has fought for and achieved a certain degree of cultural and political autonomy. Increasingly, government repression occurs due to indigenous activism concerning resource extraction on ancestral lands, which has grown under Correa in order to finance his social and economic reforms. [ix] As such, the conflicts that Ecuador faces pit the resource-dependent state against many of its indigenous peoples. [x] While Correa once had the support of CONAIE, growing tensions are reminiscent of the political landscape in which CONAIE helped depose two previous presidents. [xi] What arises is a strange state of affairs in which Correa’s government co-opts less radical aspects of a once-powerful movement, while more outspoken political dissidents are silenced. To a certain extent, this relationship makes sense. 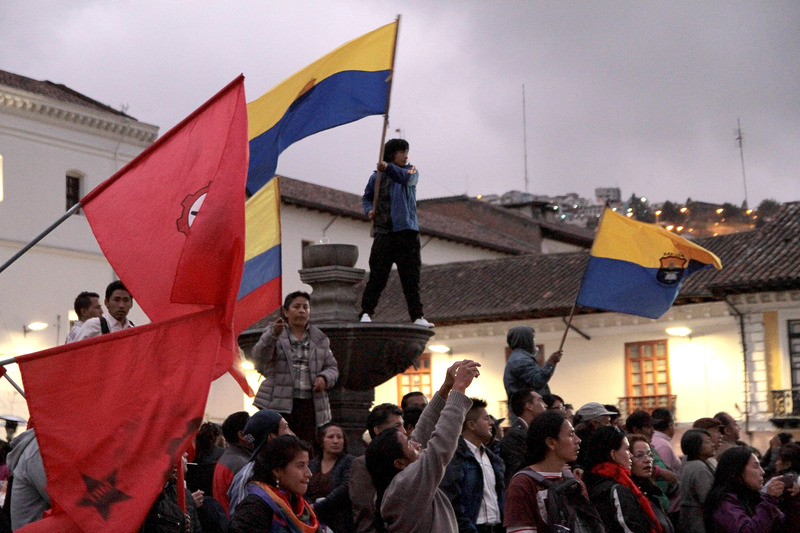 Although CONAIE strengthens civil society and checks the growing power of Ecuador’s executive, its undemocratic efforts have been heavily criticized. [xii] In the light of centralizing tendencies and Bolivarian policies (as part of the Bolivarian Alliance for the Peoples of Our America with Venezuela, Cuba, Bolivia, and others), Correa’s inclination to co-opt and restrict the indigenous movement in the pursuit of overarching goals is understandable from a policy standpoint. In that light, the indigenous movement’s choice to once again eschew conventional political channels is well-founded. In 2013, Rafael Correa reneged on an agreement not to extract oil from Yasuní National Park, citing insufficient funds from foreign sources to compensate for the lost revenue. Despite his constitution mandating that Ecuador comply with the United Nations Declaration of Rights of Indigenous Peoples, which would protect the Yasuní homeland of two indigenous groups living in voluntary isolation, Correa has also not acted on his promise to hold a referendum if five percent of the population petitioned. This case is only one of the many in which Correa has ignored the rights of indigenous peoples. If the movements like CONAIE cannot fight this assault politically, then we can expect them to revert to tendencies of mass mobilization. Indigenous communities in Ecuador are also pursuing legal means to protect their livelihoods and receive compensation for damages. Yet hypocritically, Correa’s government actually supports the case against Chevron that is being waged in several courts across the Americas (including Canada, the United States, and Argentina, in addition to Ecuador). Indigenous villagers from the Lago Agrio region have been in a thirteen year long legal struggle to compel Chevron (now owner of the the company Texaco) to pay damages for the irreparable effects of Texaco’s environmental pollution. [xiii] Chevron, meanwhile, pins most of the blame on the government oil company that partnered with Texaco, and is fighting to reverse the billions of dollars it now owes to Ecuadorean courts through charges of legal extortion and falsified reports. The next few years will likely see these conflicts escalate. Most probably, accusations will pile up against both parties, and Ecuador’s indigenous movement will have no choice but to operate outside the conventional political realm. The brief alliance that existed between CONAIE and Correa during the crafting of the 2007 constitution has crumbled, making indigenous groups likely to challenge government policies of co-optation and censure. While the indigenous movement is an important civil society check on state power, it will be hard-pressed to bring about lasting change. Despite condemnation from organizations such as Freedom House, Ecuador’s example is only one of many in which governments alternately rely on and abandon the indigenous movement to suit their political needs. Crucially, though, it is one in which indigenous peoples have had the strength to repeatedly campaign for their rights. The outcome, as such, should interest us all. Larson, Brooke. “Indigeneity Unpacked: Politics, Civil Society, and Social Movements in the Andes.” Latin American Research Review 49, no. 1 (2014): 223–41. doi:10.1353/lar.2014.0010, 226. [ii] Chartock, “How Movement Strength Matters,” 306. [iii] Bowen, James D. “Multicultural Market Democracy: Elites and Indigenous Movements in Contemporary Ecuador.” Journal of Latin American Studies 43, no. 3 (August 1, 2011): 451–83. http://resolver.scholarsportal.info/resolve/0022216x/v43i0003/451_mmdeaimice.xml, 452. [iv] Chartock, “How Movement Strength Matters,” 306; Lauderbaugh, 2012; Rice, “From the Ground up,” 175. [v] Chartock, “How Movement Strength Matters,” 306. [vi] Blaser, Mario, Ravi de Costa, Deborah McGregor, and William D. Coleman. “Reconfiguring the Web or Life: Indigenous Peoples, Rationality, and Globalization.” In Indigenous Peoples and Autonomy. Vancouver: UBC Press, 2010, 19. [vii] Novo, Carmen Martínez. “Managing Diversity in Postneoliberal Ecuador” 19, no. 1 (2014): 103–25.http://resolver.scholarsportal.info/resolve/19354932/v19i0001/103_mdipe.xml, earlier quotation from 112, this sentence taken from information on 114. [viii] Novo, “Managing Diversity in Postneoliberal Ecuador,” 107; Bowen, “Multicultural Market Democracy,” 456. [ix] Novo, “Managing Diversity in Postneoliberal Ecuador,” 118. [x] Koenig, Kevin M. “Ecuador Breaks Its Amazon Deal.” The New York Times, June 12, 2014, The International Edition, sec. OpEd; http://global.factiva.com/redir/default.aspx?P=sa&an=NYTF000020140612ea6c00060&cat=a&ep=ASE. [xi] Becker, Marc. “Correa, Indigenous Movements, and the Writing of a New Constitution in Ecuador.” Latin American Perspectives 38, no. 1 (January 1, 2011): 47–62. http://resolver.scholarsportal.info/resolve/0094582x/v38i0001/47_cimatwoancie.xml, 49. [xii] Bowen, “Multicultural Market Democracy,” 479. [xiii] Austen, Ian, and Clifford Krauss. “Court Says Chevron Can Be Pursued in Canada Over Ecuadorean Damage.” The New York Times, September 4, 2015. http://www.nytimes.com/2015/09/05/business/international/court-says-chevron-can-be-pursued-in-canada-over-ecuadorean-damage.html. Julia, a Torontonian born and raised, studies international development with a focus on political science at McGill. Her interests are wide-ranging, and you can almost always find her discussing philosophy, environmentalism, fine arts, social change, urbanism, and of course, Latin American politics. Apart from MIR Online, she is a writer for SEE Change Magazine and an editor for Latitudes.